Mike Isabella’s Kapnos: Even Better than Graffiato? We had the pleasure of stopping by opening night of Mike Isabella’s Kapnos (2201 14th Street, NW) on opening night, July 5th. Even ten days later, we are still savoring the taste of perhaps the best dinner we have had all year. While Isabella’s first restaurant, Graffiato, may have been a more anticipated opening in the media, Kapnos is already giving Graffiato a run for its money (and this is coming from huge fans of Graffiato). Kapnos is located on the corner of 14th and W Streets, a block north of U Street on the first floor of a new apartment complex. The restaurant features a beautiful open kitchen that enables the diner to enjoy a full view of the show that goes into the preparation of their dinner. On opening night, Isabella himself helmed the kitchen and inspected every dish prior to it being sent out to the table. We started dinner with one of Isabella’s kegged lemonades, a specialty of the house according to our waiter. While the second round had more fizz than the first round, both were a refreshing break from the hot and humid D.C. night that we had just come in from outside. In addition to the three versions of kegged lemonade, Kapnos has an extensive wine list and an in house sommelier (something our waiter pointed out several times) as well as many different cocktails. Like his other two restaurants, the menu at Kapnos is divided up into categories of tapas. To sample the menu fully, we tried at least one from each category (a tasting menu is also available for a reasonable $65 a person). To begin our feast, we started with two of the spreads: a standard tzatziki and the melitzanosalata. The tzatziki was good, but the melitzanosalata, a smokey combination of eggplant, feta, and red peppers stole the show. Next we moved on to the “barely raw mezze” where we chose the bronzino. The Mediterranean fish was cured in a cucumber dill sauce and topped with two small slivers of the fish’s skin that had been lightly fried and tasted almost like slightly crunchier popcorn. To pretend to be healthy, we tripled up on the vegetable section by ordering the asparagus, the beets, and the potatoes (the greek fries “vegetable” dish was not available opening night). In this section, the asparagus, lightly grilled with lemon rind and served with a generous helping of sundried tomatoes and feta, was transformed from a good but sometimes overused and forgettable summer vegetable into a stellar dish that we hope to replicate at home sometime soon. 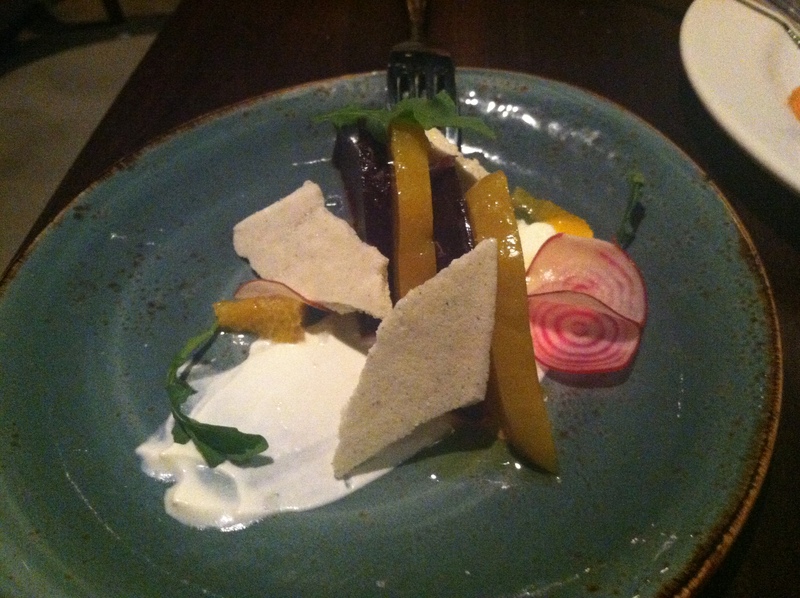 The smoky beets featured an interesting contrast between the spice of the green peppercorn crisp and the citrusy yogurt they were served with. While beets may be over featured on menus across town currently, you definitely don’t want to miss out on this delicious and unique preparation at Kapnos. The more protein heavy portion of our meal shined just as brightly as our starters. The potato garlic phyllo pie was likely the winner of the night. Light phyllo was stuffed with very garlicky (but not too overdone with garlic) potatoes and a red pepper puree and then topped with a runny sunny side up duck egg that gave the dish a remarkable creaminess. It was a dish that we will not soon forget. The roasted swordfish was nicely seared and plated over roasted cabbage (we were skeptical at first, but it turned out very nicely). When you walk by the kitchen at Kapnos, you will notice several spits roasting a variety of different meats. The spit roasted meats were one of the most talked about features of Kapnos prior to its opening and your server will likely push you towards one. Based upon our experience, definitely check out the suckling pig that is served over a grain salad. The crispy skin has a deep smokey taste that combines nicely with the savory grain salad. If you make it to dessert without being overly stuffed, we recommend chocolate mousse cake served with cherries and ice cream. While it was not the most authentic Greek item on the dessert menu, it was a great and surprisingly light ending to a very rich meal. Despite it being opening night, the service at Kapnos was flawless and very knowledgable. When we didn’t know how to pronounce one of the spreads on the menu and simply pointed, our waiter happily pronounced it for us and was always ready with helpful advice when we told him we were struggling to make a decision between two items. 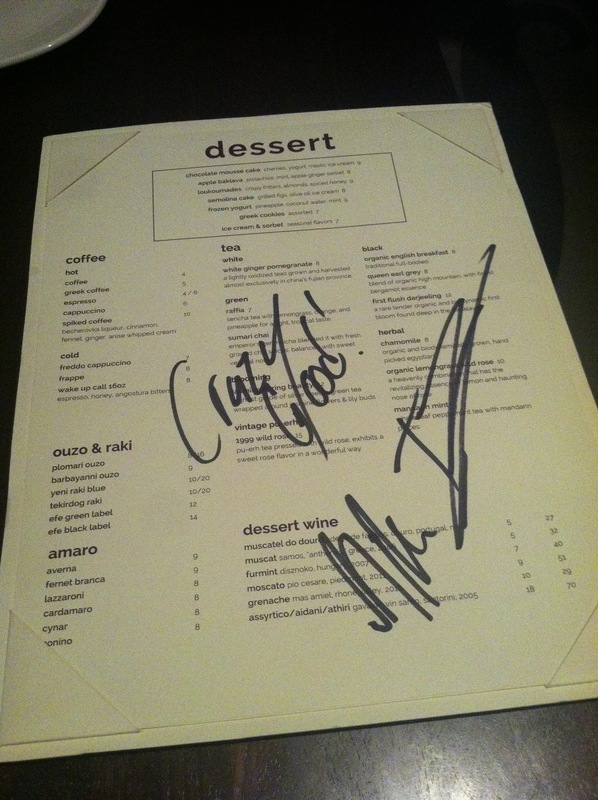 Our waiter was even kind enough to have Isabella sign our dessert menu for us on the way out. Since we attended opening night at Graffiato, we have made it one of our go-to places around town. After a great meal opening night at its sister restaurant, it looks like there may be a friendly sibling rivalry going on amongst Mike Isabella’s restaurants. Delicious! Definitely better than Graffiato and that place is good too. This is a new favorite!